Now onto today’s recipe! A few weeks ago when fall was just settling in, I helped my amazingly talented friend Brandon at boywithaknife with a dinner party he was catering to, and he taught me how to make the most stunning salad I’ve ever seen in my life! I mean, this is not your typical mustard greens and balsamic vinaigrette kinda salad. This salad, is the epitome of all that is beautiful, delicious, fresh, and celestial about our wonderful earth. Okay, slight exaggeration there, but bottom line is that it’s great. Shirazi salads originate from Shiraz (big surprise eh? 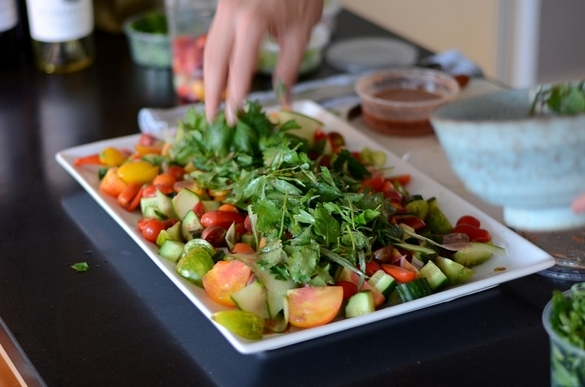 ), Iran and it’s one of the most popular middle eastern salads out there. As with any other middle eastern dish, it’s got a fantastic combination of herbs and spices that when balanced properly, are just exquisitely exotic. 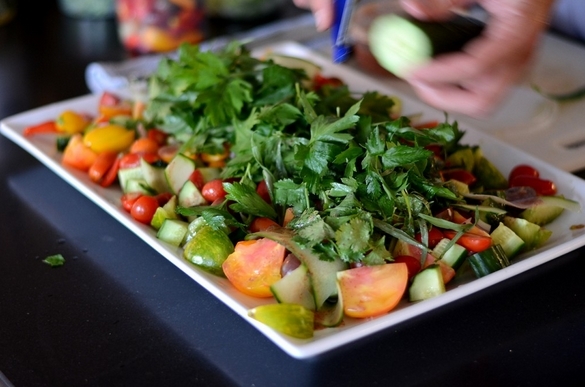 It’s base consists of mainly Persian cucumbers and tomatoes, and you toss through about a million herbs and a tangy sumac dressing to finish this salad. We grabbed a ton of beautiful heirloom tomatoes from the markets, and the colour they brought to the salad had everyone raving about it. I can’t even explain how much it excites me when salads aren’t regarded as that “boring course” people have to sit through before the meat and carbs arrive. 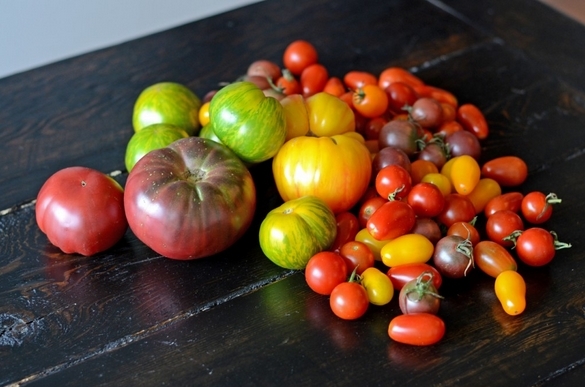 Granted, regular tomatoes would work for this recipe as well, but heirloom tomatoes are just so meaty and they just bring that extra bite that sends your senses over the edge. Also, the main difference between Persian and English cucumbers are that Persian cukes are way less watery. Often times they are seedless for the most part, and don’t continue to leech water as they sit after being cut. So if you can’t find any Persian ones, just cut out the cores of English cucumbers prior to putting the salad together. But this is one recipe you must try! 1. Cut the tomatoes and cucumbers up into bite sized pieces. You might want to shave a few pieces of cucumber lengthwise as well, just for some contrast. 2. Pick the leaves off the herbs’ stems and place aside. 3. Mix all the dressing ingredients together – it tastes even better if you do this the night before and let it sit for a bit. You might want to adjust the dressing for sweetness, oil, or vinegar depending on how you like it. It should be tangy, but not overpowering. 4. Toss everything together. To make it extra visually pretty, place the herbs on top prior to serving. Well there you have it! One of the prettiest and tastiest salads you’ll ever eat! Try it, let me know how you like it!